Nitrate and phosphate are naturally occurring nutrients in the environment, both essential for plants and animals. However, during the past decades, due to extended usage of fertilizers and detergents, as well as due to impropriate disposal of human and animal waste, the presence of nitrate and phosphate in the aquatic ecosystems became serious environmental and human health issues. Namely, the excessive loading of streams, rivers, lakes, bays and coastal waters with nitrate and phosphate can causes excessive algae growth, deteriorating water quality and severely reduce or eliminate oxygen in the water which, at the end, results with illnesses or death of large numbers of fish. Some algae also produce harmful toxins, which can be accumulated in fish and shellfish if they are grown at polluted aquatic environment. Numerous evidence also confirmed negative effect of elevated nitrate and phosphate concentrations in drinking water on human health. Ingested via drinking water, nitrates can cause life-threatening methemoglobinemia for infants. Some epidemiological studies also associated long-term exposure to high nitrate concentration in drinking water with the occurrence of diabetes, certain cancers and reproductive problems, while the chronical exposure to high phosphate concentration was related with incidence of renal disease, damage of blood vessels and induce of aging processes. To prevent further environment loading with nitrate and phosphate compounds, as well to reduce the risk for population health, various techniques were used for their phosphate removal from drinking and wastewater. 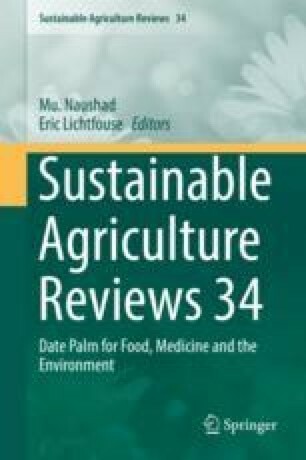 This review presents the results of studies which tested the possibility of nitrate and phosphate removal from aqueous solutions using the date palm assisted nanocomposite materials.